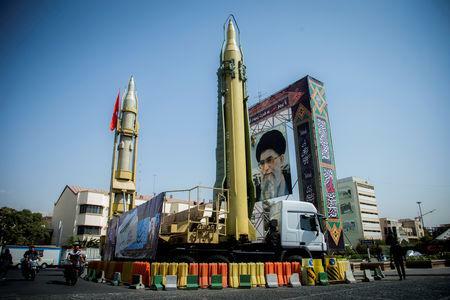 GENEVA (Reuters) - Iran wants to increase its missiles' range, a senior military official was quoted as saying on Tuesday, a move that would irk the United States which views Tehran's weapons program as a regional security threat. "One of our most important programs is increasing the range of missiles and ammunition," said the head of the Iranian air force, Brigadier General Aziz Nasirzadeh, according to the semi-official Fars news agency. "Making a mockery of the UNSC won't obscure failure to fulfill obligations & to hold US to account over non-compliance. Esp when even US admits that UNSCR2231 does NOT prohibit Iran's deterrent capabilities. Rather than undermining 2231, better to work towards its adherence by all." Zarif wrote. At the weekend, U.S. Secretary of State Mike Pompeo condemned what he described as Iran's testing of a medium-range ballistic missile capable of carrying multiple warheads as a violation of the agreement on Tehran's nuclear program.